This post is brought to you in collaboration with the lovely people at BC Egg. Ground pork, shrimp, carrots, glass noodles, eggs, wood ear mushrooms, and plenty of fish sauce, topped with a golden-yellow egg yolk mixture and steamed (or baked, or pressure-cooked) to perfection. This isn’t your grandma’s meatloaf. Well, I mean it is if your grandma’s Vietnamese, in which case I really hope she approves of my recipe. Say xin chào bà! to her for me. Please don’t make me say it myself. I’m sure I’ll mispronounce something. Seriously though, it’s funny how the quintessential American-style meatloaf has come to represent the sum-total of meatloaf in the Western collective consciousness. Meatloaf, that hallmark of mid-20th century American cooking, is something that many of us in North America grew up with. Whether the word meatloaf evokes a feeling of pleasant nostalgia or uncomfortable nausea seems awfully dependent on the particular recipe your family used – or the skill of the cook responsible for it. I was never too fond of our family’s particular iteration, though I can’t say why; I was and still am a sucker for a homemade hamburger, which seems similar in so many respects. Regardless, when we take a step back from the US/Canadian-centric pop-culture perception of the iconic middle-class meatloaf, we can clearly see that a mixture of ground meat formed into a loaf and baked (etc.) isn’t even close to being a North American (or even Western) specialty. Meatloaf is, in that sense, quite a bit like chicken soup or dumplings; a combination of ingredients so familiar and accessible, prepared so simply and memorably, that it’s evolved independently and/or traveled seamlessly from culture to culture around the world. A quick glance at the Wikipedia entry for meatloaf lists 29 different international variations. You could start a blog just dedicated to meatloaf. Let me know if you do. Unsurprisingly, the many loaves-o’-meat found around the globe vary a great deal based on local ingredients and culinary preferences. In Vietnam, the concept of meatloaf goes in a couple of different directions, though none of them are particularly similar to the Western baked dishes. This isn’t terribly surprising as oven-based cooking is not historically common in East and Southeast Asia. The aforementioned Wikipedia article mentions giò in the section on Vietnam, but that’s only part of the story and a little linguistically complicated. Giò (pronounced like ‘jo’ or ‘zo’, with a descending tone) is a slightly tricky word to translate exactly, but it basically means sausage or meat paste. You may be familiar with this word as part of chả giò – the Vietnamese word for spring rolls. Now wait a minute, I hear you say, a spring roll isn’t meatloaf. Fair enough – but it does reveal some interesting overlap and culinary similarity. The chả part of chả giò basically means ‘patty'(having evolved from the Chinese 鮓 – meaning minced, salted, preserved fish), so a spring roll is essentially a patty of sausage (or meat paste). I mean… we’re playing a bit fast and loose with the idea of patty, but languages are fun that way. This recipe doesn’t have the word giò in it, but it does have that tricky chả term. Chả trứng hấp translates to patty (of) egg steamed, which is nicely descriptive. Both of the words chả AND giò show up in one of the Vietnamese dishes that we can truly think of as a meatloaf. Giò lụa or chả lụa (the Northern and Southern Vietnamese terms respectively) is a steamed meatloaf or sausage made from a paste of pounded lean pork and spices wrapped in banana leaves (or aluminum foil). This tasty dish is sliced and served in soups, bánh mì, etc. Why am I telling you this? Because my research and linguistic wrangling made me realize that a) spring rolls are wrapped sausages, b) giò lụa (chả lụa) is clearly both meatloaf and sausage, and by extension c) all meatloaf is a essentially giant free-form or prismoidal sausage. I’m not sure what to do with this. I mean, what IS a sausage? For that matter, what ISN’T a sausage?! Existential sausage crises aside, this recipe takes us out along a separate branch of the Vietnamese meatloaf family tree. Chả trứng hấp is, like chả lụa, a steamed meatloaf. It’s got a lot more going on though, as it takes a more one-and-done sort of approach to meal-making. With added veggies, eggs, spices, and a mixture of pork and seafood, it’s a more complex meatloaf that can easily anchor a meal. And honestly, in the weird and wild pantheon of meatloaves, I think chả trứng hấp deserves special recognition. Pork and shrimp (or crab – more on variations below) are incredible together, and all that fish sauce really amps up the tangy, rich, umami-bomb aspect of the meal. Eggs add flavour and hold things together wonderfully, and the golden egg-yolk topping adds a visual punch that leaves ketchup-topped Western meatloaves feeling a little Plain Jane. Am I body-shaming a meatloaf? Yeesh, too much to unpack there, let’s keep going. But I think one of the best things about it is the textural element that comes into play courtesy of the wood ear mushrooms and mung bean noodles. Meatloaf isn’t generally the most texturally exciting meal in the world, but this is decidedly different (and delicious). Is this the best meatloaf in the world? Well I’m going to take the safe/conciliatory/cowardly route and say that there’s room in my heart for all of the many regional variations. But if you invite me over to try something from your new meatloaf blog (to thank me for giving you the idea of course), I have to admit – I hope that you’ll be serving this one. This is some tasty, tasty comfort food. And like all good comfort food, it can be tweaked, twisted, and modified depending on your personal tastes and/or available ingredients. 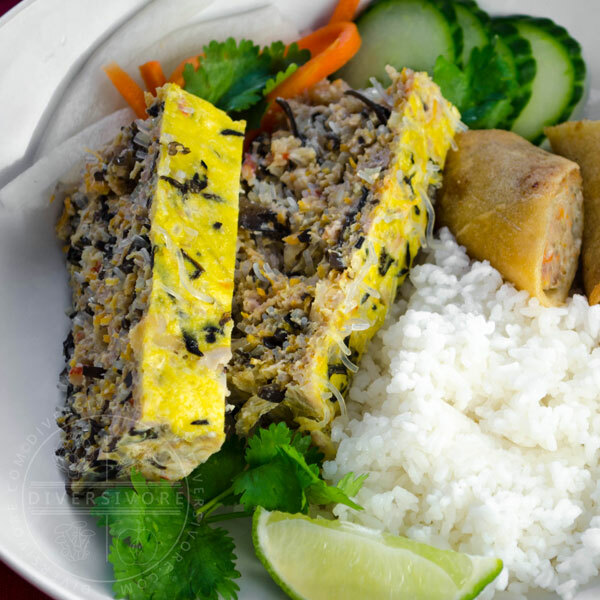 There are definitely some cornerstone elements involved here that really make this meatloaf both distinctly Vietnamese and distinctly delicious, and they may necessitate a trip to a specialty grocery store if you don’t do a lot of Vietnamese cooking. The notes below should help you find what you need and, when necessary, make substitutions. You can also take a few different approaches to cooking this meatloaf. Steaming is traditional and quite easy, but if you lack the equipment I’ve got a few alternative methods that you can try out. These are also detailed in the section below. When it comes to actually making this, there’s not a whole lot of culinary expertise or complicated prep needed. In fact, I would say that if you’re newer to Vietnamese cooking (or cooking in general) this is a great recipe to get started with, as it’s got a lot big, bold, distinctive flavours and yet it comes together very easily. You could make this recipe with pork alone, though I strongly recommend that you use shrimp (or another seafood – more on that in a moment). The flavour is more complex and a little lighter. That being said, there’s no reason you can’t experiment – chả trứng hấp can also be made vegetarian with tofu, so feel free to take whatever protein-based diversions you want to try out. Shrimp is particularly nice with pork (hence the enduring popularity of Chinese siu mai dumplings), but it’s also quite tasty with crab. Crab is certainly pricier and, for most of us, a little harder to get fresh, but if you’ve got some good crab that you want to use then it would go wonderfully here. Likewise, a mild white-fleshed fish would work very well in place of the shrimp OR the pork. Catfish would be a nice choice, as would basa. You’ll end up with some textural differences if you sub out the pork, but the eggs should hold everything together quite nicely, and the wood ear, noodles, and carrots still contribute heavily to the texture of the final dish, so you’re good to go. I haven’t personally experimented with the tofu-based version of this recipe, but it’s supposed to be quite tasty. Tofu-based chả chay (a vegetarian version of the chả lụa I mentioned above) is excellent, though it can be tough to go truly vegetarian because fish sauce contributes a lot to these recipes. Still, it’s not impossible. If I give it a go, I’ll update this section – and if you have any tips, let me know in the comments! Also known as cellophane noodles, glass noodles, or bean thread noodles, these are frequently mistaken for thin rice noodles (which are also quite popular in Southeast Asian cooking). These noodles are made from a flour derived from ground mung beans (surprise surprise). When cooked, they become clear and glassy, rather different from the white/opaque appearance of cooked rice noodles. They also tend to have a chewier, bouncier texture than rice or wheat noodles. Mung bean noodles are easily found at most Asian grocery stores. If you’re having trouble differentiating them from rice noodles, it can be worth knowing the name in other languages. They’re fěnsī (粉絲) or dōngfěn (冬粉) in Chinese, wun sen (วุ้นเส้น) in Thai, and bún tàu or bún tào in Vietnamese. If you want/need to substitute for the mung bean noodles, there are a few options. There are numerous other cellophane noodles made from other starches, and these can be used fairly interchangeably. The Korean varieties (dangmyeon – 당면) are made from sweet potato starch, while the Japanese ones (harusame – 春雨) are made from potato starch. Cellophane noodles made with arrowroot starch can be found in South Asian cooking, generally under the name falooda. It’s also worth noting that there’s an additional Vietnamese cellophane noodle variety called dong riềng that’s made with canna root flour. Any of these cellophane noodles can be used in place of the mung bean ones, but do pay attention to the size of the threads, as some may be considerably thicker than others. I don’t personally recommend using rice noodles, as they become softer and more delicate than you want. All cellophane noodles are made without wheat, and as such are gluten-free and celiac-friendly. Wood ear mushrooms are one of those ingredients that might seem a little intimidating at first (especially for the mushroom-averse), but are actually very easy to work and very agreeable to most tastes. Wood ears, so named for their ear-like shape and the fact that they grow on the sides of trees, are a common dried ingredient at most Asian grocery stores. They’re also called cloud ear fungus, which actually refers to a different species from Asia that’s virtually identical from a culinary perspective. Other names include wood ear fungus, wood fungus, ear fungus (which make me laugh), jelly ears, and Jew’s ears. The latter term is unlikely to come up in Asian grocery stores, but it’s an interesting one nonetheless. The term is a reference to the mushroom’s scientific name (Auricularia auricula-judae), which means Judas’ ear (as in Judas Iscariot). This is a reference to the notion that Judas hung himself from an elder tree, on which these ear-like fungi can be found growing. Wood ear mushrooms aren’t terribly easy to substitute for, as they serve a textural role more than anything. Let me reassure the fungi-phobes out there that these have absolutely nothing in common with crimini/button mushrooms in terms of texture or flavour. When rehydrated and cooked they have a crispy/rubbery sort of texture, and a mild flavour that borders on neutral. Because they’re sold as a dry, shelf-stable product, a bag will last for a very long time when stored in an airtight container. If you can’t find them or don’t want to use them, you can substitute more carrot and bean thread noodles to add a bit of texture to the meatloaf. If you’re looking for a more pronounced mushroom flavour, a wide variety of minced mushrooms can be added, either in addition to or as a substitute for the wood ears. You can omit some of the pork in favour of minced mushrooms too. The egg yolk layer is pretty self-explanatory, so I won’t give a whole lot of detail here, but I will note a popular variation. 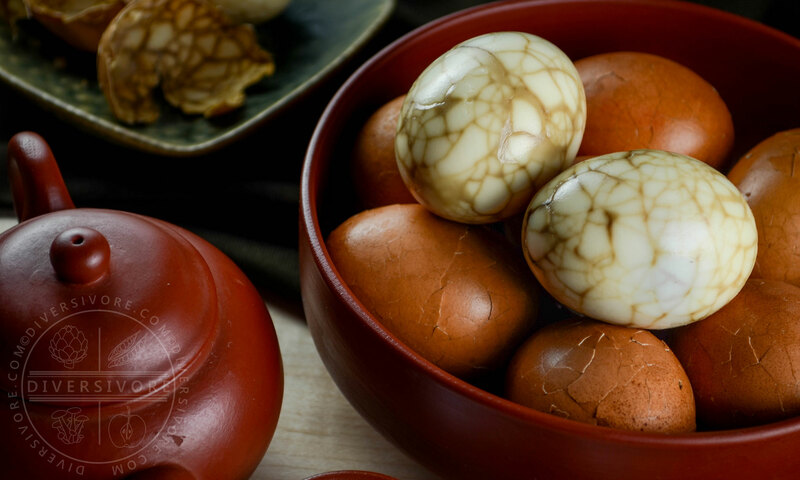 Many Chả Trứng Hấp recipes will tell you to mix annatto powder with the yolks in order to make the topping a richer yellow/orange colour. You can certainly do that if you like and if you can find annatto powder (Filipino grocery stores are a good bet), but if you’ve got eggs with nice rich, orange yolks then you don’t really need to bother. I didn’t use annatto powder for this recipe, and you can see the colour in the photos for yourself. If you do choose to add annatto powder, about 1/4 tsp should do the trick. Traditionally steamed, Chả Trứng Hấp can be made a variety of ways in the modern kitchen. There aren’t any substantial differences in time or difficulty for any given method, so you can adapt the recipe to whatever kitchen gear is most convenient for you to use. This is the basic method, and the one I’ve given detailed instructions for below. I won’t repeat myself too much here, but I will mention a few notes and tips. Steaming is pretty fool-proof, but it’s easy enough to cause a bit of a cosmetic slip-up by letting the steamer lid drip water onto the top of the meatloaf. This will leave whitish blobs on the egg yolk that, while not affecting the flavour at all, do impact presentation. Avoid this by lifting the lid at an angle and letting the condensation drip off to the side, away from the pan. I use a large metal steamer with a glass lid, and this makes it easier to judge how much condensation you’ve accumulated. If your lid is solid (e.g. a bamboo steamer) just take care to lift it carefully. If you want to steam the meatloaf but don’t have a dedicated steamer, fret not! You can set up a steamer of sorts by filling a large pot (e.g. a heavy-bottomed Dutch oven) with about 2 inches (5 cm) of water. Place a wire rack inside of the pot, and rest your meatloaf pan on top of this, then cover with a vented lid (e.g. a pot lid with a small hole to let steam escape). If you don’t have a suitably tall wire rack you could use something else to prop up the pan, but make sure that it’s heat-proof and not going to move around as the water bubbles and steams. Got an Instant Pot and want to use it to steam your meatloaf? Read on below! The meatloaf can be baked quite easily too, though you’ll want to make sure you keep a closer eye on it to avoid drying it out. The process is fairly straightforward – bake the mixture without the egg yolk layer on top in a 200°C (400°F) oven for 18-20 minutes. Remove the meatloaf from the oven, spread the yolk mixture over the top and return everything to the oven for 4-5 minutes, or until the egg is golden and set. 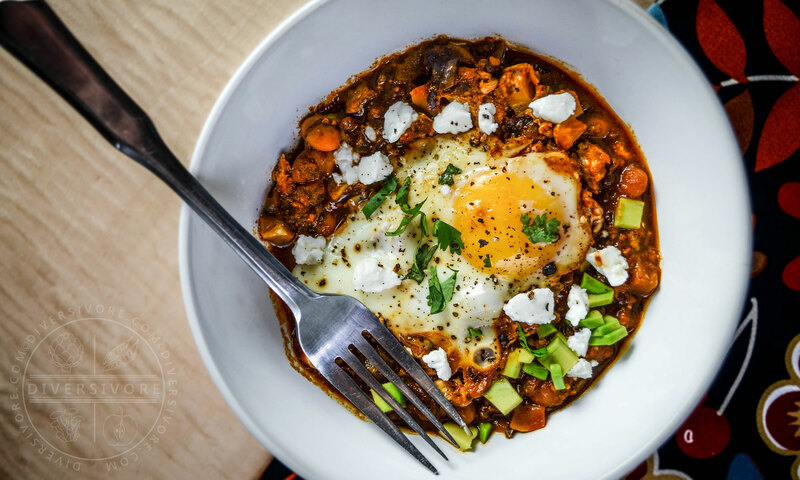 You don’t need to make many changes in order to make this in the Instant Pot (or other electric pressure cooker). IN essence, you’re basically using the electric pressure cooker as a steamer, though it will cook a bit faster thanks to the higher pressure. That being said, you’ll most likely need a smaller, deeper pan that can fit inside of the Instant Pot. The deeper dish means that the meatloaf needs to steam longer (or at a higher temperature, as is the case inside of a pressure cooker) which means that the cook time isn’t much shorter than for a steamed version. Place the metal steamer insert in the bottom of the Instant Pot (6 quart or larger in order to accommodate a bigger pan) and add 1 cup of water to the bottom of the pot. Place the meatloaf (with the egg yolk mixture already spread on top) on the steamer insert. Seal the lid, ensuring that the valve is closed, then cook on manual (high pressure) for 20 minutes. Quick release the valve and cool/serve as for the steamed version. Take care to remove the lid carefully and at an angle so that the hot condensed water doesn’t drip on the egg-yolk topping. Note that the 20-minute cooking time assumes that you’ve made a thicker meatloaf in a smaller pan in order to accommodate the IP inner container size. If you do choose to cut the recipe in half then you can reduce the cooking time to about 15 minutes. Note: information shown is for a single portion, or 1/8th of the total meatloaf. A little high in saturated fat, though not overwhelmingly so. The sodium levels are not overly high, but (as with many East- and Southeast-Asian dishes) they are on the higher side. You can cut the saturated fat by using more seafood and less pork. If you want to bring the salt down a bit, you can cut the added salt by a quarter or so, though it’s worth noting that the fish sauce is also a primary source of salt (and flavour). Soak the wood ear mushrooms in warm water for 15-20 minutes, or until softened and pliable. Once the mushrooms are ready, chop them into thin slices, or mince them. Soak mung bean noodles in cold water for 10-15 minutes. Once they're soft and flexible, cut them into approx. 5 cm (2 inch) pieces. 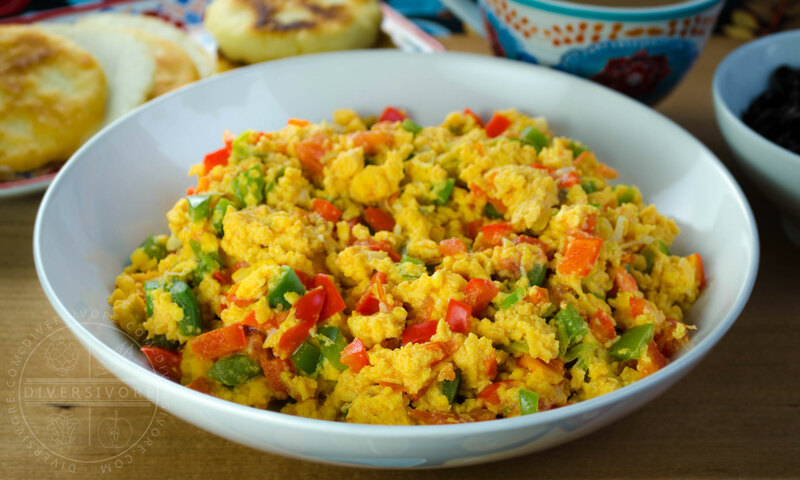 Combine all of the ingredients EXCEPT FOR the two reserved egg yolks in a large bowl. Mix thoroughly, ensuring that the eggs and egg whites are distributed evenly. Line a large, flat pan with parchment paper. A brownie or cake pan works nicely, but anything that's not too deep and fits in a steamer will work. If you don't have parchment paper you can use aluminum foil or some vegetable oil to line the pan. Spread the mixture in the pan. Smooth out the surface as much as you can. Whisk the egg yolks with a pinch of salt. Pour them evenly over the surface of the meatloaf, tipping the pan to get the mixture to the edges if necessary. Place the meatloaf in a steamer (see notes for variations). Cover and steam for 20 minutes. You may need to adjust the cooking time if your pan is on the small side, as it will make the meatloaf thicker. If in doubt, check the internal temperature with a meat thermometer - it's done at 71°C (160°F). When uncovering the finished meatloaf, take care to let condensation on the lid drip away from the egg mixture to avoid discolouring it (there's nothing dangerous with getting water on the top, but it's less attractive). Let the finished meatloaf sit for about 10-15 minutes before slicing and serving alone or with broken rice. You can substitute crab for the shrimp, or omit the seafood altogether and use more pork. Baking - if you don't have a steamer you can bake the mixture without the egg yolk layer on top in a 200°C (400°F) oven for 18-20 minutes. Remove the meatloaf from the oven, spread the yolk mixture over the top and return to the oven until the egg is golden and set (4-5 minutes). Cool and serve as for steamed version. Instant Pot - this is basically just the steamed version adapted for an electric pressure cooker. You'll most likely need a smaller, deeper pan (or half the recipe) in order to use the Instant Pot, so the cook time isn't any shorter than for a steamed version. Place the metal steamer insert in the bottom of the Instant Pot and add 1 cup of water to the bottom of the pot. Place the meatloaf (with the egg yolk mixture already spread on top) on the steamer insert. Seal the lid, ensuring that the valve is closed, then cook on manual (high pressure) for 20 minutes. Quick release the valve and cool/serve as for the steamed version. (Note that this cooking time assumes that you've made a thicker meatloaf in a smaller pan in order to accommodate the IP inner container size - if you do a half recipe you can cut the cook time to about 15 minutes). This isn’t a recipe it’s a work of art! I’ve never come across such an original recipe that’s this gorgeous too. I wouldn’t have thought that you would have such a thick slice with as few ingredients and I can’t wait to wow John when he sees my new obsession on the table. I’ve not used wood ear mushrooms but love about anything called a mushroom so will be on the hunt for them. Thank you for a very interesting history of this dish and its ingredients. I really enjoyed reading all of your research! That’s so kind of you to say Julie! I’m glad you like the recipe. Obviously I can’t take all the credit – this is a Vietnamese classic! I’ve just done my best to put out a version that balances the ingredients and flavours as nicely as possible while making the recipe accessible and understandable. Hopefully I’ve done a good job. As for the wood ears, they’re a really fun and interesting mushroom, though they certainly differ quite markedly from the softer gilled mushrooms (button, shiitake, etc.). I find most people enjoy them when they get a chance to use them though, especially when they’re mixed into a dish like this one. Enjoy! Oh, Sean, this is one of the best pieces of food writing I’ve read. And I have read A LOT of food writing. I spent about a year reading 10-15 books actually called “Best Food Writing”. This piece is on par with those books. Just brilliantly and funny written. Very informative and interesting. Thank you! Julia, you made my day! Thank you so much for saying such kind things about my writing. I definitely enjoy doing this, and it’s always nice to know that other people enjoy reading it (though I certainly understand when people click the ol’ ‘Jump to Recipe’ button – sometimes you’ve just gotta get cooking). I haven’t heard of those books, but I’d certainly be honoured to be featured in something like that. Cheers! This sounds AMAZING!! When I was a kid I hated (like really hated) meatloaf. Every time my mom made it, I did not want to eat dinner. As an adult, my tastes have changed. I DO NOT make meatloaf like mom did. I WOULD make this meatloaf for sure. I happen to think ground pork rocks!! Must be the Ukrainian in me. This meatloaf is gourmet all the way. It would turn meatloaf haters into meatloaf lovers in the first bite!! Thanks Gloria! It’s a polarizing dish, isn’t it? I feel like many of us grew up disliking meatloaf, and yet when we think about it we should be able to come up with a recipe that suits our own particular tastes. My own mom told me that she made a different meatloaf recipe way back in the day, but my Dad didn’t like it. The one we grew up with (not my favourite) happens to be the one my DAD loves. So there you go. In any case, I’m glad you like this, and I definitely agree on ground pork! Eastern Europe and Eastern Asia can form a united front on that one. As always, you astound me with your knowledge! I’ve never been a meatloaf fan. I think my mom made it so often it robbed the dish of any joy it once represented. But a Vietnamese version I can’t turn down! And the quantity of eggs add an element of economy that the American counterpart can’t boast. Very excited to try something new. Thanks! Aw, thanks Charity! What can I say? I love food and I love research. Your sentiments about meatloaf seem to be pretty common, so I’m glad this one has revitalized your interests. Good point about the eggs and the economic aspect too! It’s definitely a very simple and approachable recipe for those with Asian cooking experience, and (hopefully) a great gateway recipe for anyone looking to become more familiar with Vietnamese cuisine. Enjoy! The alternate title for this is “Not your momma’s meatloaf.” I always enjoyed a good meatloaf growing up, but we definitely had a more basic generic version of meatloaf. I’d love to try this recipe! Great info and variations. Thank you for the very detailed and informative intro. You brought me right along and put me in a place where I understand the basis of the recipe and feel confident I can make perfectly the first time. And I would definitely keep the pork/shrimp combination. That is such a classic and will keep the flavors well balanced. Thank you Annemarie! Honestly that’s what I’m always aiming for, first and foremost. I want all my recipes to be the kinds of things that a person can read through and think “Ok, I’ve got all the info I need to really give this a go.” I agree on the pork/shrimp, though it’s always worth exploring variations for those with dietary restrictions. I’ve got pescetarian friends and I’m thinking about trying a tofu/shrimp version. I think it could be quite nice. I’m drooling right now! This Vietnamese meatloaf combines all the things that I love the best about Vietnamese cooking into one simple dish. I would love to try the shrimp and pork version because that’s always a winning combo. And that egg yolk topping looks to die for! Thank you for writing such an informative recipe! The all-in-one aspect is certainly one of my favourite things about this (and other meatloaves, for that matter). Glad you like the post, and I hope you love the recipe. Cheers! I’ve never thought of calling a meatloaf beautiful but yours certainly is. The texture and the different color of the ingredients makes it pleasing to the eye. Now, the combination of ingredients makes me think of a symphony of flavors that comes to an amazing finish. That touch of yellow yolk on the top really sets it off. I’m truly impressed. You always give us such a wealth of information. I enjoy reading about your recipes. Thank you Marisa! I was drawn to chả trứng hấp by the ingredients and that golden yellow top, but I was pleasantly surprised at how cool the whole thing looked in the end. I have to say, when I put a slice on a plate of broken rice along with those veggies and spring rolls, I was pretty smitten. Glad to know that you’re feeling the same way! Cheers. Such an interesting take on meatloaf. So refreshing and colorful. I love the tradition behind it and all the variations and tips you give. I can see cutting it into very small squares and serving with toothpicks as an appetizer. Thanks Debra! Glad you like it. Cool idea on the appetizer thing too – I think you’d want to keep the pieces a bit on the bigger side in order to keep them from being too crumbly, but it would work. Dropping the quantity of noodles might help with a slightly thicker texture too, but either way it’s a fun thought! Hah, I understand exactly what you mean. Meatloaf doesn’t exactly scream ‘gorgeous plating.’ But I’m thrilled you liked it so much! And hey, if that meatloaf blog starts up, I’ll try to be one of the very first followers. Sounds like a fun idea to me. Thanks Sabrina! Glad you like it. Never thought that typical meatloaf’s could be transformed as a Vietnamese Cuisine. This looks delicious and healthy too. Can’t wait to try this at home.